FIFA has confirmed that it will be bringing disciplinary proceedings against England and Scotland for displaying poppies in the recent world cup qualifier between the two home nations. Football fans might rightly ask why FIFA is focusing on this issue, when there are plainly more important matters coming across the desk in Zurich. But rule breaches need to be dealt with, so we can all have trust and confidence in FIFA as an institution. Which is why this saga is all the more absurd. Apparently, neither what's happened in previous matches nor a sensible advance discussion with FIFA are reliable ways of working out what will or will not be a rule breach. The question is whether a poppy is a political, religious or personal slogan, statement or image - the wearing of which is contrary to Rule 4 of the Laws of the Game. That is a legitimate question. 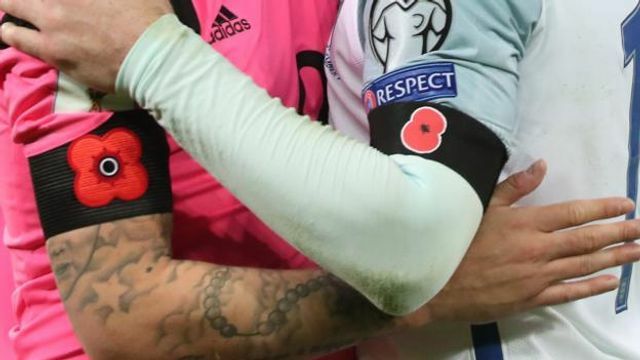 Consider the view of Republic of Ireland midfielder James McClean, who refused to wear a poppy while playing in England because it represents all the conflicts that the British Army has been involved in - including those in Northern Ireland. But instead of engaging with the issue, FIFA simply spouted the rules, claimed it had not banned poppies and then waved the stick of disciplinary action. It says that, since the rules are made by the International Football Association Board, FIFA cannot pre-judge what will be a breach of those rules. Patently the idea that FIFA cannot form a view is wrong. Like any other governing body, FIFA interprets the rules, considers previous events and regulatory decisions, uses analogies and applies its discretion on a daily basis. It is not clear why it considers itself unable to do so here. It is correct that FIFA is dealing with more than 200 national governing bodies and their diverse cultures. But if FIFA can't take a pragmatic approach and give guidance without resort to the disciplinary committee, then query the point of engaging with FIFA at all. This had better go all the way to CAS (with the attendant time, costs and distraction for all concerned). Then at least we will know for next time. Football's rules are laid out by IFAB and any breach is dealt with by Fifa's disciplinary committee - which Fifa says is an independent body. Fifa added it could not pre-judge what symbols would constitute a breach of rules. Fifa opens disciplinary proceedings against England and Scotland.